The fall reflected lower inflation for services, retail items and electricity & gas. 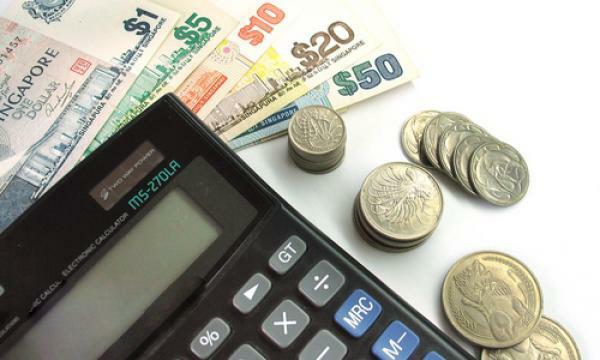 Singapore’s core inflation, excluding the costs of accommodations and private road transport, eased to 1.5% on a YoY basis in February from 1.7% in January, according to data from the Monetary Authority of Singapore (MAS) and the Ministry of Trade and Industry (MTI). The fall reflected lower inflation for services, retail items and electricity & gas, the agencies explained in a statement. Despite lower core inflation, consumer price index (CPI-All Items) inflation edged up to 0.5% YoY, from 0.4% in the previous month, due to more gradual declines in private road transport and accommodation costs, which outweighed lower inflation for services, retail items and electricity & gas. Private road transport costs dipped 2.3% YoY in February, less than the 3.4% drop in the preceding month, due to smaller declines in both car and petrol prices. Accommodation costs fell 1.6% YoY, slower than the 1.9% decline in the previous month. “This was due to a more gradual fall in housing rentals, as well as a larger increase in the cost of housing maintenance & repairs,” MAS and MTI highlighted. MoM, accommodation costs increased 1.8% as Service & Conservancy Charges (S&CC) rebates were disbursed to households living in HDB flats in January, but not in February, data showed. The cost of electricity & gas rose at a slower pace of 5.5%YoY compared to the 6.5% increase in January. This reflected the effect of the phased nationwide launch of the Open Electricity Market (OEM) on electricity prices, the agencies noted. The overall cost of retail items inched up 1.1% YoY, easing from the 1.4% increase recorded in January, mainly on account of a smaller rise in the prices of clothing & footwear, whilst services inflation moderated to 1.5% from 1.7% in the previous month. This was due to a slower pace of increase in education services fees as well as airfares. According to MAS and MTI, external sources of inflation receded as global oil prices fell sharply in Q4 2018, mainly on oversupply concerns. As a result, global oil prices are expected to be lower in 2019 compared to 2018. On the domestic front, supportive labour market conditions should underpin wage growth and continuing price pressures. “However, the extent of overall price increases will be capped by greater market competition in several consumer segments, such as telecommunications, electricity and retail,” they added. 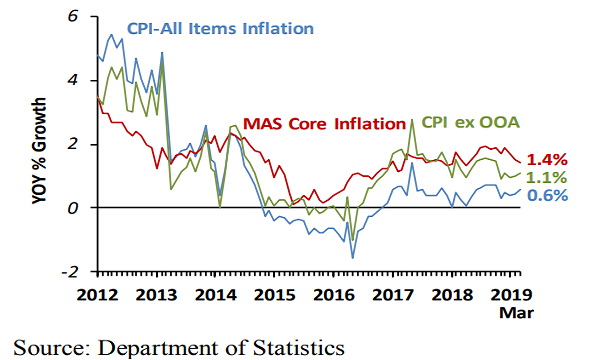 In 2019, MAS Core Inflation and CPI-All Items inflation are projected to be in the ranges of 1.5–2.5% and 0.5–1.5%, respectively.